EghtesadOnline: Iran's elite Revolutionary Guard said Saturday a U.S. Navy aircraft carrier fired a warning shot in an "unprofessional" confrontation with Iranian vessels, the official IRNA news agency reported. According to Bloomberg, the report said the confrontation took place Friday afternoon and the U.S. navy ships left the area following the encounter. 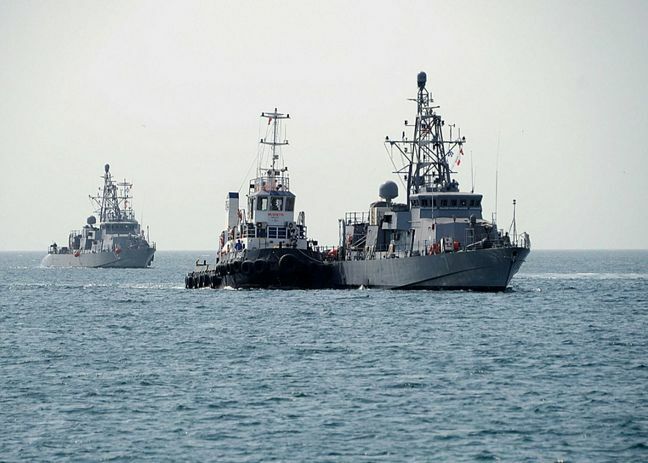 The U.S. Navy's Bahrain-based 5th Fleet said the incident happened while one of its helicopters was on a routine patrol in international airspace. The aircraft saw several Guard vessels approaching American ships "at a high rate of speed" and sent out flares after receiving no response when it tried to establish communications, the Navy said. That prompted the Iranian boats to halt their approach. After communications were established, the U.S. saw the Iranians conduct a "gun exercise." That routine exercise involved them firing weapons into the water away from American ships, said Navy spokesman Lt. Ian M. McConnaughey. The Navy described the encounter "as safe and professional." Also Saturday, Iran's parliamentary committee on national security and foreign policy held an urgent meeting with deputy foreign minister and senior Iranian negotiator Abbas Araghchi in which they reviewed measures that the country may apply in response to a package of sanctions the U.S. Senate approved Friday against Iran and sent to President Donald Trump for signing. Araghchi told state TV Saturday that the decision is a "hostile" breach of the deal. "It is a breach of the deal in articles 26, 28 and 29," said Araghchi. "A strong answer will be given to the action by the U.S."
The articles say the U.S. Administration, acting consistently with the respective roles of the President and Congress, will refrain from re-imposing the sanctions or any policy specifically intended to directly and adversely affect the normalization of trade and economic relations with Iran. The U.S. legislation imposes mandatory penalties on people involved in Iran's ballistic missile program and anyone who does business with them. The measure would also apply terrorism sanctions to Iran's elite Revolutionary Guard and enforce an arms embargo. Democrats said the new sanctions would not conflict with the landmark 2015 nuclear deal between Iran and world powers. On Friday, the United States, France, Germany and Britain, who brokered the 2015 nuclear deal with Iran along with China, Russia and the European Union, said they're raising concerns with the United Nations over Iran's Thursday launch of a satellite-carrying rocket into space. In a joint statement, they said that Iran's launch was "inconsistent" with a U.N. Security Council resolution that enshrined the nuclear deal. On Saturday Iran's foreign ministry said the missile program is part of "domestic policy of the country, deterrent and at service of regional peace and security." Tehran and Washington have had no diplomatic relations since 1979 when Iranian militant students stormed the U.S. embassy and took 52 American hostages for 444 days.